FIBC Type A is made from non-conductive fabric and provides no protection against static electricity. FIBC Type B is made from non-conductive fabric. It differs from FIBC Type A in that the breakdown voltage through the fabric, including any coating, shall be low enough to prevent propagating brush discharges. objects such as tools or metal clips being placed on the FIBC. Or a 20 mm Strip, in which case each thread or filament must be Interconnected at two separate places (usually at both ends). FIBC Type C must be provided with a grounding point to which all conductive panels, threads or filaments are electrically bonded. The resistance to the grounding point from anywhere on a conductive fabric and from conductive threads or filaments must be less than 108 Ω. The lifting loops of FIBC Type C must also contain conductive threads or filaments with a resistance to the grounding point of less than 108 Ω. FIBC Type C must also meet the breakdown voltage requirements of FIBC Type B.
point(s) and clearly stating the requirement for grounding. These types of FIBCs are manufactured exactly the same as Type-C, except for the additional safety part of being Flame Retardant. This is achieved by adding special chemicals to the bag components. However the disadvantage is the UV part of the bag is negated due to the interference with the FR additive. These are mainly used in the underground Coal Mines where there is a present danger of Sparks as well as Fire at the same time. energy corona discharges. Some FIBC Type D have low resistively coating that may reduce the risk of incendiary discharges. Grounding of FIBC Type D is not required. 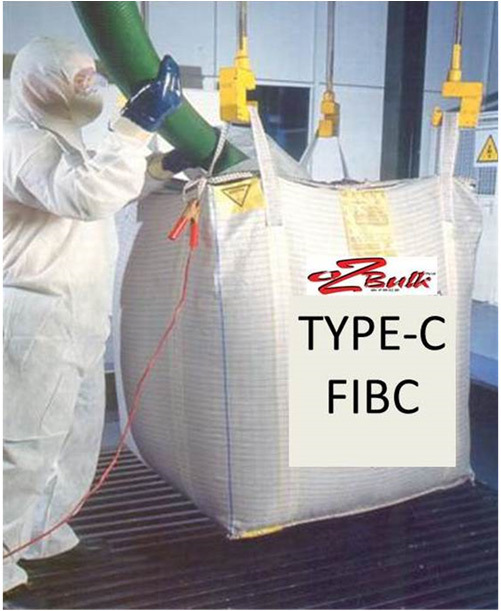 To be qualified as safe for use in the presence of flammable or explosive atmospheres it must be first demonstrated that FIBC Type D does not produce incendiary discharges under realistic conditions.